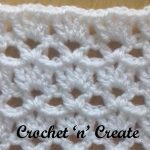 Free Crochet Stitch Tutorial V-stitch puffs – A lacy stitch made up of v-stitch and puffs, looks lovely when used for projects such as scarves, blankets, shawls or ladies tops. 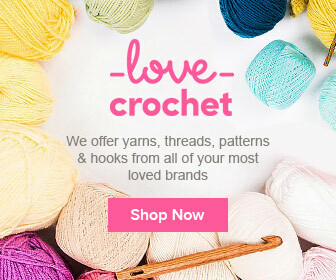 Hope you crochet some stunning items with it. 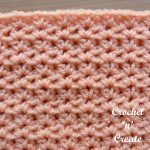 If you would prefer to skip my pictures and print the v-stitch puffs — tutorial, scroll down the page to the PRINT icon at the bottom of the post. v-stitch. (dc, ch2, dc) in same space or stitch. 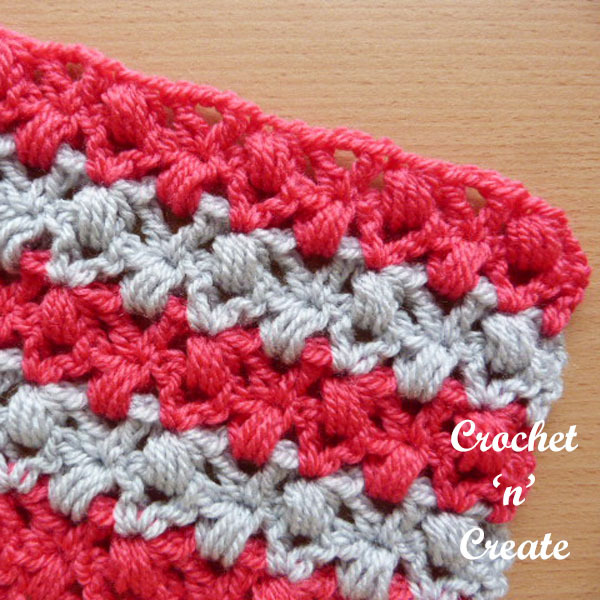 * yo, insert in stitch and pull up loop, * rpt from * to * twice more, yo, pull through all loops. Make a chain length loosely in multiples of 6 + 5. First Row – Work v-st (see abbrev) in 4th ch from hook, * skip 2ch, PS (see abbrev) in next ch, skip ch2, v-st in next ch, * rpt from * to * to last ch, work dc in last ch. Turn. Second Row – ch3, skip dc, PS in next ch2 space, * skip dc, v-st in top of PS, skip dc, PS in next ch2 space * rpt from * to * to end, dc in top of 3tch. Turn. Third Row – ch3, v-st in top of next PS, * skip dc, PS in next ch2 space, skip dc, v-st in top of next PS, * rpt from * to * to 3tch, work dc in top of ch3. Turn. 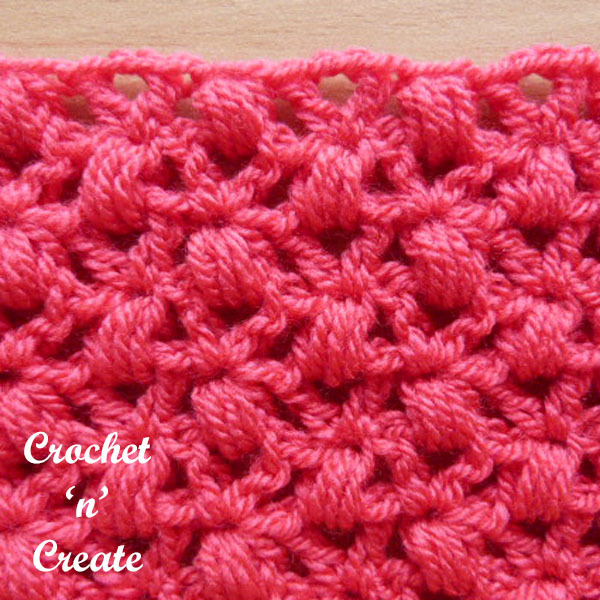 Rpt Second & Third Row until you have the length you need. v-stitch. 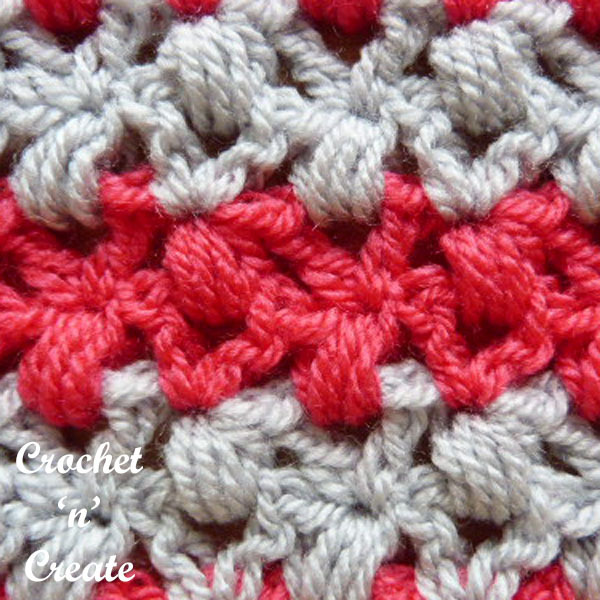 (1tr, 2ch, 1tr) into same space or stitch. 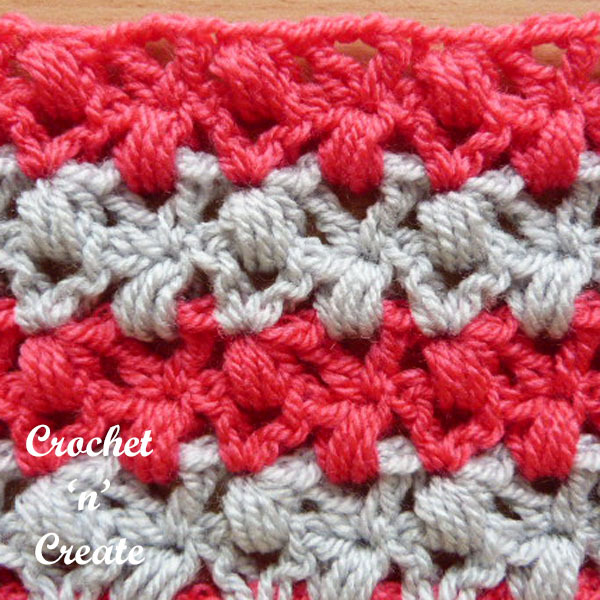 * yrh, insert into stitch and pull up loop, * rpt from * to * twice more, yrh, pull through all loops. First Row – Work v-st (see abbrev) into 4th ch from hook, * miss 2ch, PS (see abbrev) into next ch, miss 2ch, v-st into next ch, * rpt from * to * to last ch, work 1tr into last ch. Turn. Second Row – 3ch, miss 1tr, PS into next 2ch space, * miss 1tr, v-st into top of PS, miss 1tr, PS into next 2ch space * rpt from * to * to end, 1tr into top of 3tch. Turn. Third Row – 3ch, v-st into top of next PS, * miss 1tr, PS into next 2ch space, miss 1tr, v-st into top of next PS, * rpt from * to * to 3tch, work 1tr into top of 3ch. Turn. 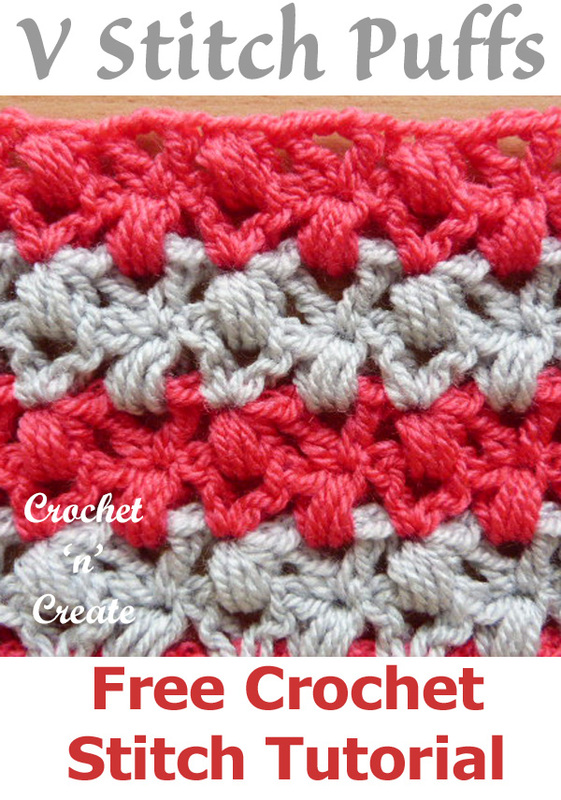 The written instructions and the pictures for this free crochet stitch tutorial v-stitch puffs are copyrighted to crochet ‘n’ create © 2018. 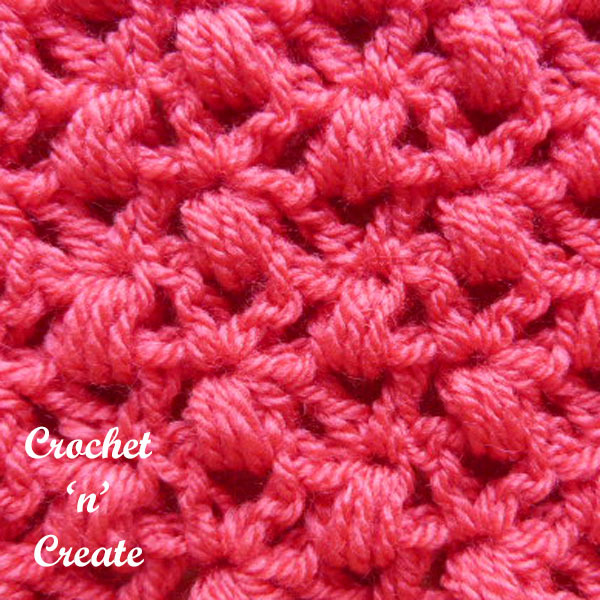 You are welcome to sell any of your finished products made from the free crochet stitch tutorial v-stitch puffs, I just ask that you use your own pictures and put a link back to crochet ‘n’ create. 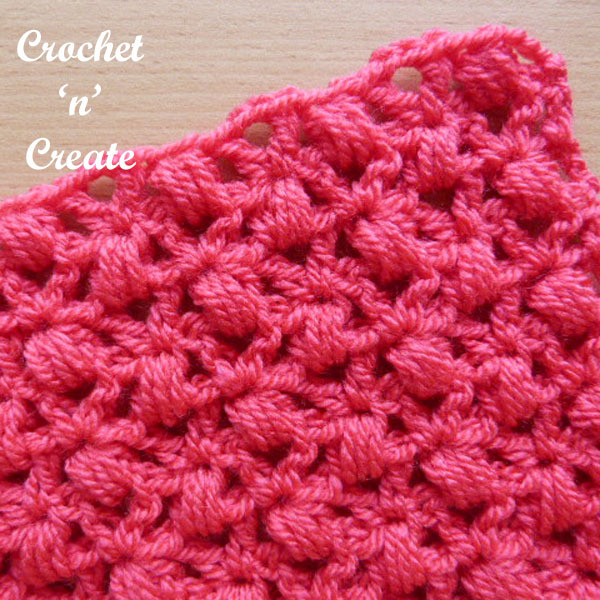 If you wish to tell your friends and followers about the free crochet stitch tutorial v-stitch puffs, please can you only use the direct link to the page on crochet ‘n’ create. 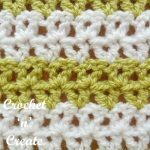 This entry was posted in Crochet Stitches and tagged crochet, crochet stitches, crochet tutorial, How too on 6th December 2018 by crochetncreate.